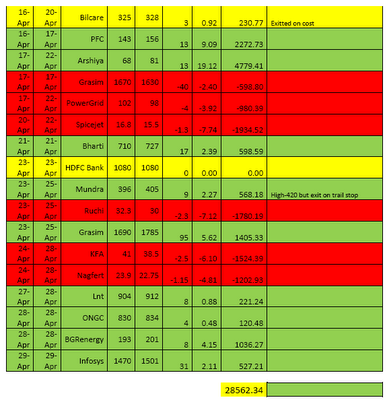 1) Trading portfolio size of 2 lakhs with almost zero leverage. 2) Short trades closed at last trading price end of day. Positional Short trade considered in FNO trades. 3) Strategy is to book partially and then raise stoploss close to or above acquisition price and then trail towards the higher targets. So average selling price is lower than the targets mentioned in the sms/yahoo messages. 4) Generally not more than 6-8 open positions and allocation of money can be higher than the fixed size of 25k exposure. But we have considered it for simplicity in calculation. 5) Many traders/investors may have generated more than the above returns with a different money allocation and profit booking. 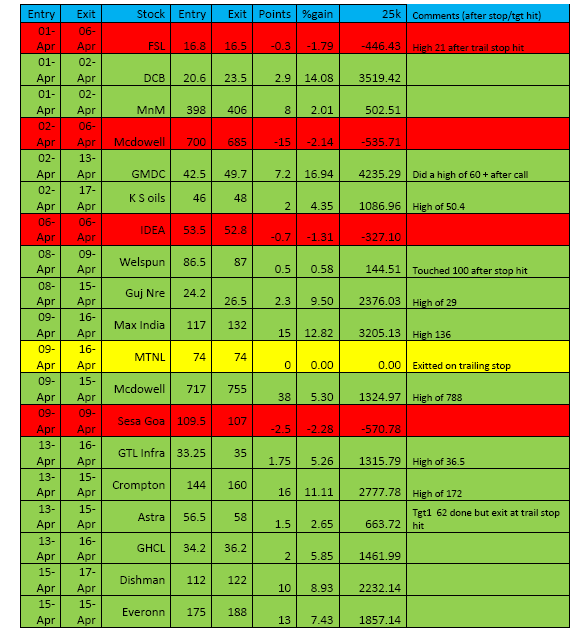 7) This is a just an example and we don’t advise on position sizing or allocations. Returns possible from the above calculation are approximately 13-14% in the period 1st April to 30th April through the trading calls which may be close to or more with a dynamic money management. FNO and investment calls considered in a different sheet. 1) Investment portfolio size to maximum of 2 lakhs which is generally not fully utilized.We may have around max 6-7 investment picks in this segment which may also be added at breakout levels for trading to reduce acquisition cost to optimize gains. 3) Pyramid Strategy discussed in the newsletter/blog in which we started with very small quantities of around 15-40% of maximum capacity. 4) LnT was advised to buy around very small qty around 10-15% of maximum allocation so we would consider 10k exposure in it taken last month. 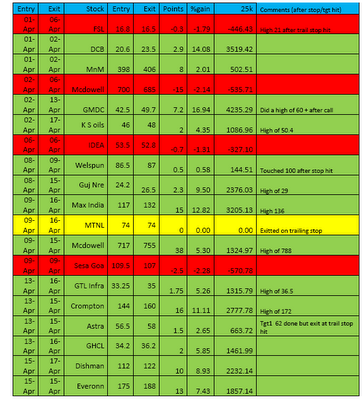 5) For the other small caps DCB, Kirl Electric , PSL ( last month ) and Genus,Max,Emco ( this month ) around 25-40% of maximum allocation so we would consider 15k exposure in the same. 6) We may also have some investment or positional picks mentioned in the newsletter which are few have not been considered. 1 lakh is total cash deployed. 1 lakh cash available can be utilized for increased allocation in short term trades or investment picks or derivative trades to increase the possible returns. Returns of 34k on cash deployed which is 34% on investment exposure and 17.5% on total portfolio of 2 lakhs. At the end of the month after booking out exposure is 15k with half of holding kept in Max,DCB leaving us with good amount of cash for further investments/trades in coming months. For derivative trades and further details check the full report below. To subscribe to the above services check the below link for the details. This is just a sample report and made for the first time so please point out if any mistakes/miscalculations/suggestions.